Have we finally got a decent low cost Android smartphone? The Samsung Galaxy Europa i5500 is more expensive than the truly budget Android handsets, but it is a well specified smartphone that hits all its marks. 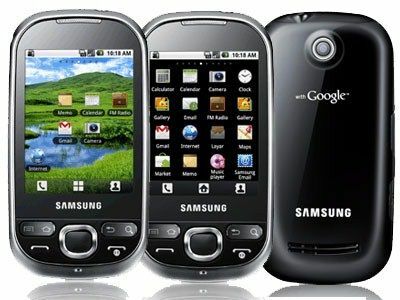 The Galaxy Europa i5500 is another small format Android handset, running Android 2.1 but also packing in a much more pocket-friendly price. You can get it on deals from £10 a month, and SIM free we found it for £186.83 inc VAT at online retailers such as Clove. This means the Galaxy Europa is a notch up the food chain from the ultra low cost Alcatel OT-980, and closer in price to the LG Optimus GT540. So, all other things being equal it ought to be better than the former and close to the latter. In fact, we'd say it is rather better than both those offerings. It has the Android necessities of Wi-Fi, 3G and GPS on board and there is 140MB of user memory, plus a 1GB microSD card in the box. The build has a weird asymmetrical design that makes the phone look fatter at the top than at the bottom when viewed edge on. That's an optical illusion created by the fact that there is a silvery edging to the handset that sits at a non-uniform angle. It forms the whole of the top plate, then slants along the edges so that it can form a lip on the bottom front of the handset. Clever, but not rocket science, really. The actual dimensions are 56 x 108 x 12.3mm, and the handset is not thinner at one end than the other. The plastic build materials mean the Samsung Galaxy Europa i5500 is quite light at just 102g, but the plastic doesn't feel shoddy. We doubt the Samsung Galaxy Europa i5500 will survive to many falls from a great height, but the odd drop from a table top ought not to cause it any real harm. The shiny black backplate is a fingerprint magnet, and we aren't sure we need the 'with Google' reminder on the backplate. The front fascia is positively riddled with buttons and the area in which they sit looks cramped, though actually using the buttons did not feel especially squeezed. We are never really sure you need Call and End buttons on an Android handset and in this case there is a shortcut to the dialler hardwired to every main screen. At least the End button doubles as the off switch. There's a nice sized D-pad which, like Call and End buttons, can feel redundant on a handset with a touch screen, though we can see why some people might like to use one from time to time. Samsung has also found room for two extra buttons – one offering the Android Menu and Home functions, the other giving you Back and Search functions. There are very slightly concave, which helps with ease of use. Samsung hasn't gone overboard with side buttons and connectors. There's a 3.5mm headset connector on the top edge, nothing on the right or bottom, and on the left a volume rocker and microUSB power connector.